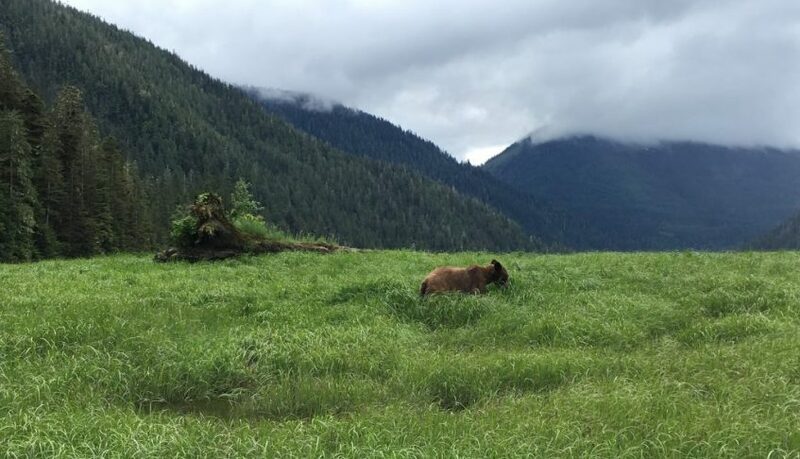 It’s a great day to be a grizzly bear in British Columbia: BC’s government has banned all grizzly hunting in the province (though First Nations can still rightly hunt them for food, social or ceremonial purposes, or for treaty rights). Here’s some coverage from CTV News. Having spent several days up close and personal with wild grizzlies at BC’s Khutzeymateen Grizzly Bear Sanctuary this summer while doing research for this collaborative Smithsonian photo essay (and staying aboard Ocean Light II), I thought I’d post a few quick pics in celebration. But for professional photos from conservation photographer Neil Ever Osborne, plus grizzly facts and bear-viewing stories, please give the photo essay a read. 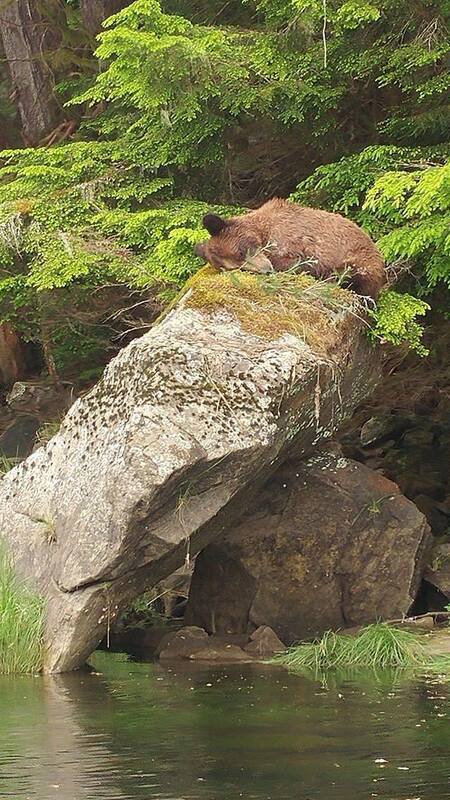 There are bears, bears everywhere in BC’s Khutzeymateen Grizzly Bear Sanctuary. Here’s one munching on protein-rich sedge. Wading in an all-you-can-eat salad bar of sedge. Grizzlies have been wiped out in many parts of the world, and they’re currently listed as threatened in some part of BC. The 50 or so who live in the Khutzeymateen have been lucky; thanks to a dedicated team of conservationists and tour guides, they’ve been protected since 1994. 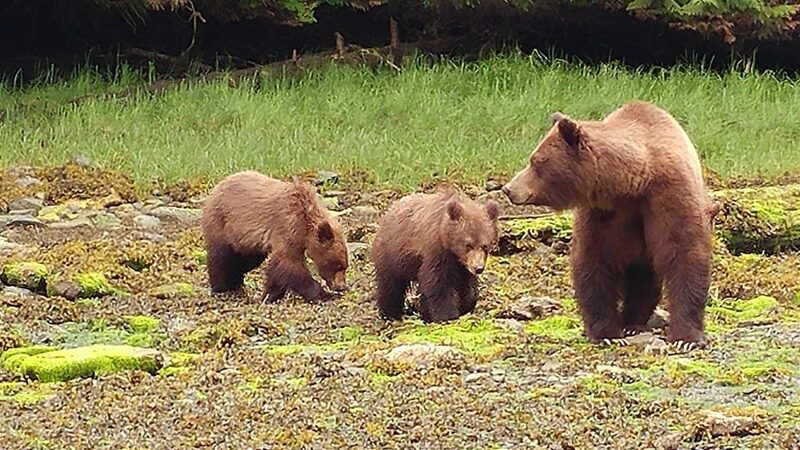 As of today, the rest of BC’s grizzlies are now protected, too. I commend Premier Horgan, the NDP, and BC’s Green Party for coming to this decision and leaving our grizzlies in peace. As a parting shot, here’s the view flying into the Khutzeymateen by float plane (you can also sail in). 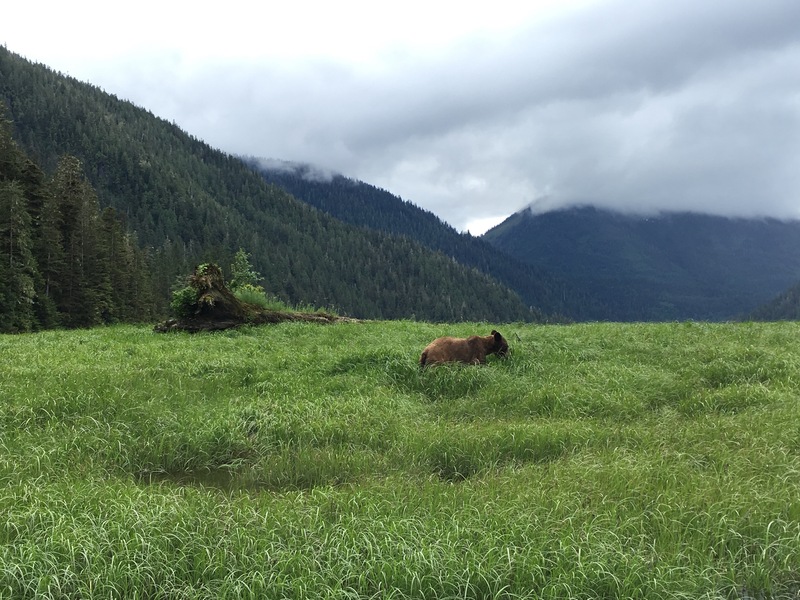 When you’re protecting grizzlies, you’re helping to support a healthy ecosystem like this one. 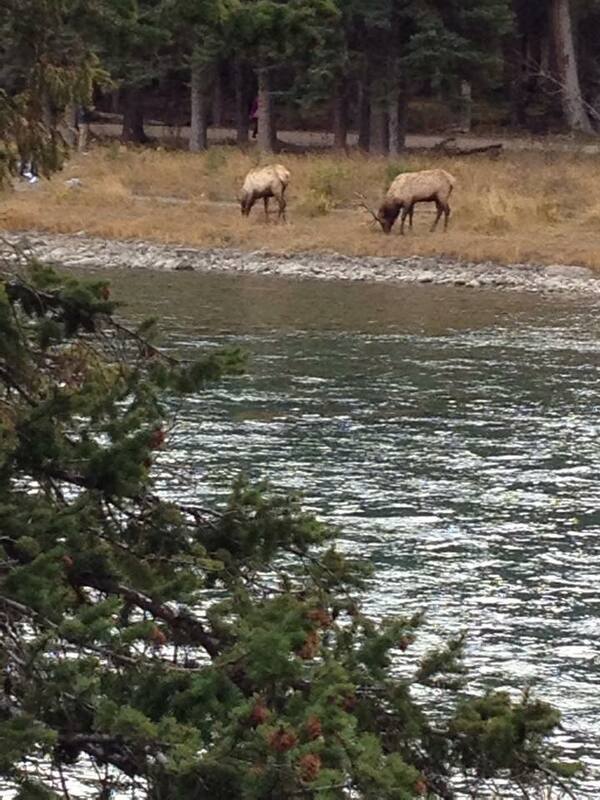 That’s BC forest at its finest: wild, pristine, and primeval. May it remain so for generations of grizzly bears to come. 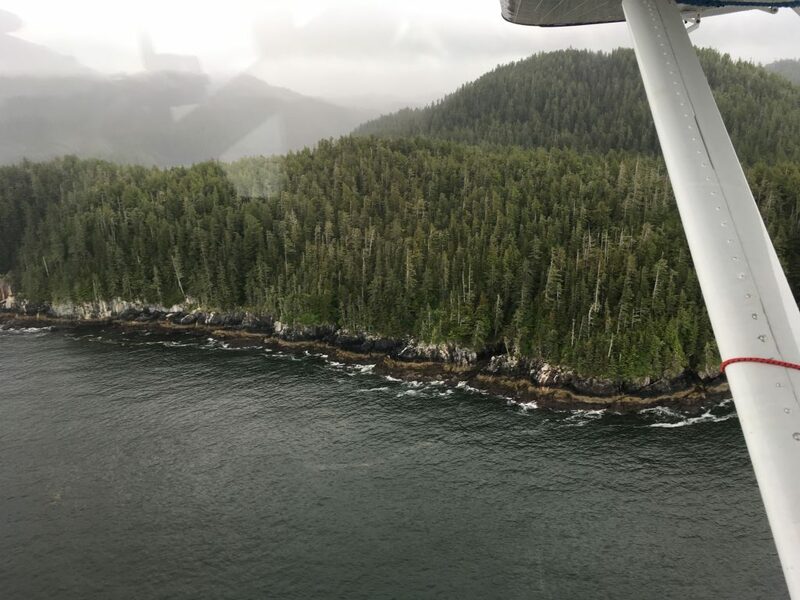 Soaring into the Khutzeymateen Grizzly Sanctuary by float plane. 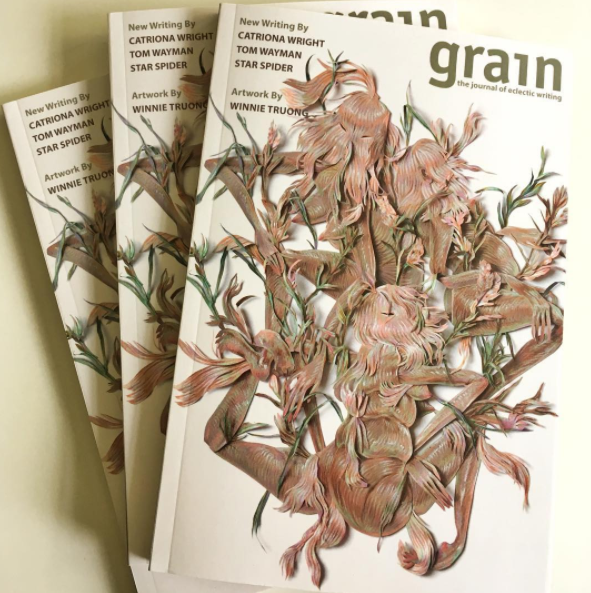 There’s nothing quite like the feel of a fat package in your mailbox—especially when it contains contributor copies of Grain Magazine. I’m thrilled to announce that my essay “Brahman is the Charioteer” is in the Spring 2017 issue of this eclectic Canadian literary journal. Grain Magazine, Spring 2017. Cover art by Winnie Truong. Finding peace has become a vital endeavour. Not just between nations and people, but in the small morsels within our daily routines, those in-between moments where we transition from one activity to another: when we take the bus home, or after we put the kids to bed, or when we’re doing the dishes after a big dinner. It seems that peace within our own lives is difficult to find and almost impossible to sustain, so to hope for a better future appears fantastical. This Zen-themed issue feels like the perfect home for my essay, which is about my late mother’s love of Sanskrit and our complex relationship with spirituality—and each other. The essay contains chapter segments of a book-length memoir I’m working on; it’s a coming-of-age story about a girl with cystic fibrosis struggling to live up to the utopian ideals of her spiritual community in Iowa, and the mother who brought her to live there. More on that later. For now, I hope you’ll head to your nearest bookstore and get Grained! I was born in a crater. My Northern Ontario birthplace was formed 1,849 billion years ago when a 10-kilometre-wide meteorite—actually, now they’re saying it was a comet—travelling at 8 times the speed of sound crashed to the earth. The massive impact formed what is now known as the Sudbury Basin, the earth’s second-largest crater at 62 km long and 30 km wide. That sucker punch from outer space filled the earth’s sunken face with molten rock containing nickel, copper, platinum, palladium, gold, and other metals. It took centuries for the pulverized rock to cool, and until the late 1800s for settlers in the Sudbury Basin to figure out they were sitting on, literally, a gold mine. 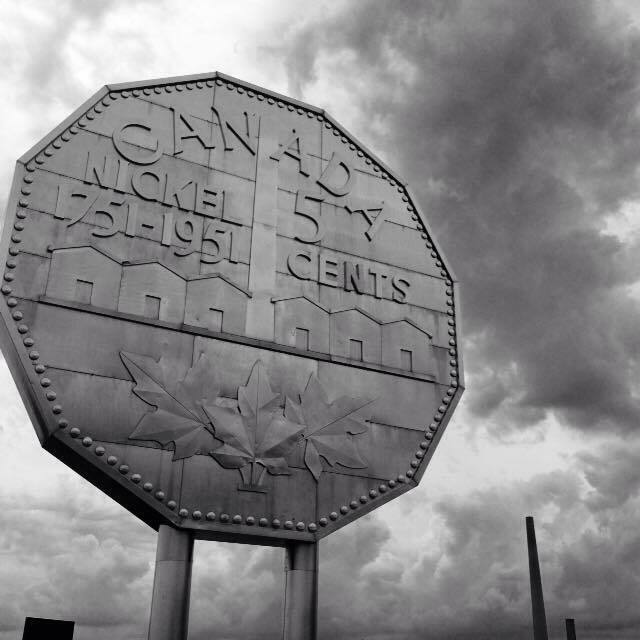 Sudbury, home of the mighty Big Nickel. By the time I was born in 1974, the city’s mines—Inco and Falconbridge—were two of the world’s leading producers of nickel. I grew up playing under giant plumes of sulphurous smoke belched by Inco’s massive smokestack at the refinery. My friends and I scrambled over the lunar landscape of rocks turned black by the copper smelting process. Some nights, Mom would drive my sister and me to see the slag being dumped by the mines. We’d sip milkshakes and watch the hot, lava-like substance spill down the side of a hill, mesmerized by its beauty. That’s right. I said beauty. For that’s what Sudbury was to us, then: the magical, pockmarked backdrop upon which our imaginations could roam freely. With a little creativity, rocky outcrops became British boarding schools. Grassy backyards became stages for elaborate dance recitals. Graveyards became sites of espionage and intrigue as my sister and I hid behind tombstones, pretending our pointed fingers were guns. OK, we were strange children. But as Ray Bradbury puts it, “Trains and boxcars and the smell of coal and fire are not ugly to children. Ugliness is a concept that we happen on later and become self-conscious about.” (That’s from the introduction to Dandelion Wine). Indeed, I did grow self-conscious about Sudbury in my teens, especially after I moved away. “I’m from Sudbury,” I’d say apologetically to other Canadians, who’d laugh and say, “Ah, yes, the armpit of Ontario” (it turns out other cities like Hamilton share this dubious moniker as well). But now, after a visit back home this summer, I realize Sudbury is actually the heart of Ontario. For me, anyway. 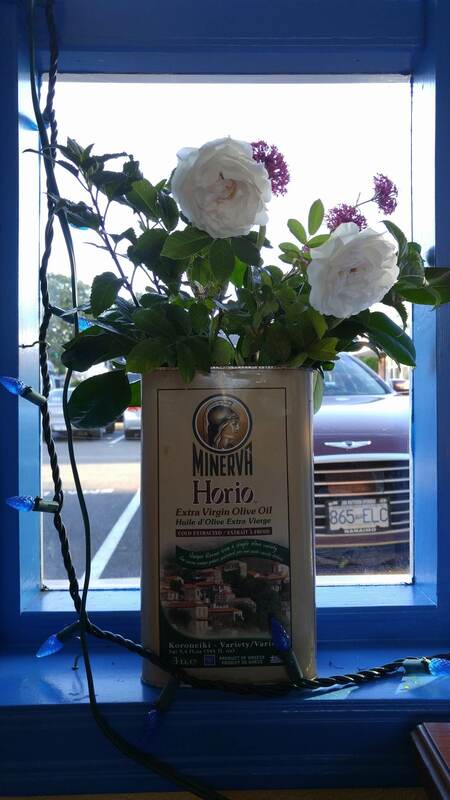 The city’s greening efforts—they’re now growing trees in the mines!—have, over the decades, transformed Sudbury into quite a leafy, picturesque city in many places. 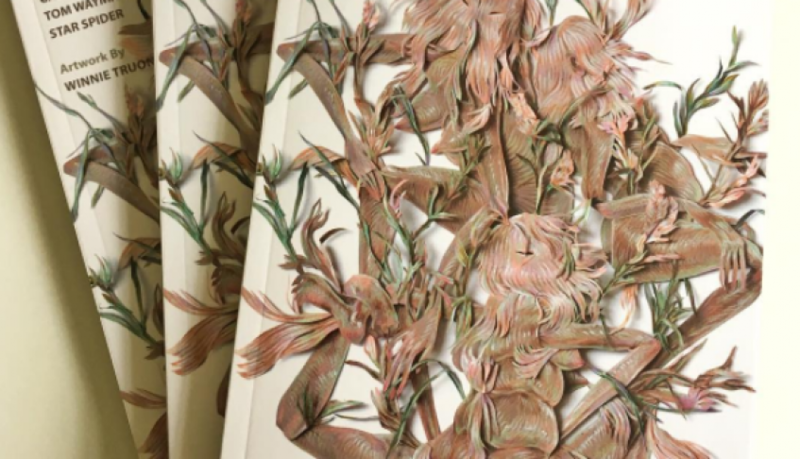 Art is springing up all over town, too, thanks to Up Here, an emerging art and music festival. There are hundreds of freshwater lakes scattered throughout the area. And, of course, Sudbury is home to friends and family members—including my father, my wonderful step-family, and my indefatigable grandmother, still going strong at 100. 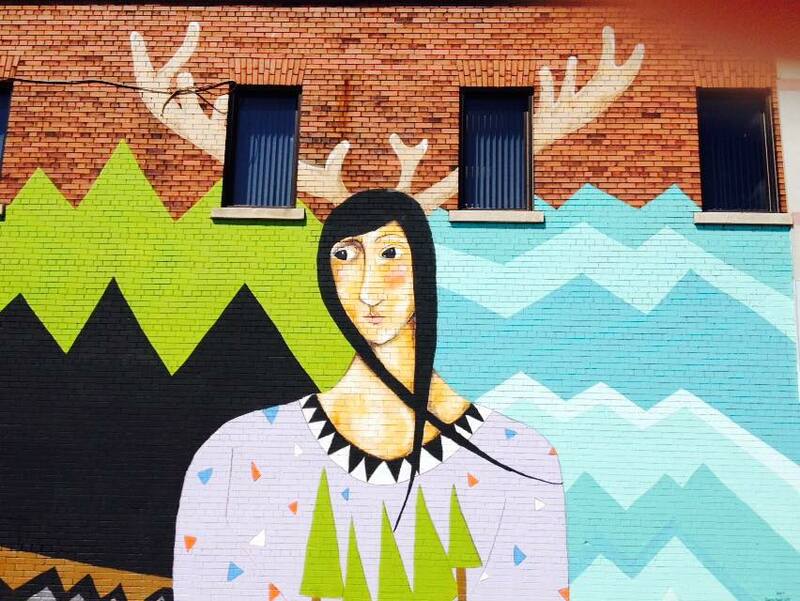 Mural in downtown Sudbury by artist Danielle Daniel. However, the giant smokestack, now owned by a Brazilian company called Vale, still remains. The weather-beaten roads are potholed and plastered together with asphalt and tar. There are defunct breweries, shambling shacks, and, yes, graffiti-covered boxcars. At its core, Sudbury remains Sudbury—a hardscrabble frontier town built in a crater that was created when the cosmos decided to give the earth a walloping clout on the chin. 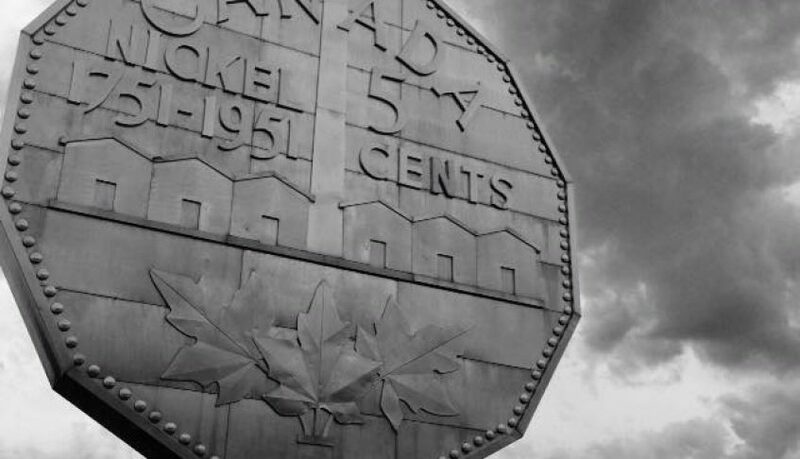 Sudbury is gritty, tough, and has gold at its core—both the chemical element and the people. And that’s a beautiful thing. As a child, my imagination sprouted in the somewhat barren Sudbury of the 1970s and ’80s—just like the seedlings that now grow in Vale’s greenhouse, 4,800 feet below the earth. It has taken me several decades to really start mining my creativity and publishing essays and poems, but if I keep going, perhaps I’ll hit gold one day. Or perhaps not. But if my hometown has taught me anything, it’s the power of perseverance. In any case, I’m enjoying digging deep into my past and present for material. Sometimes, I stumble over subject matter that, at first glance, seems quite bleak—chronic illness, death, mortality, and madness, for starters. Fortunately, Sudbury has trained my eye to see the beauty shimmering beneath the soot. Who wants to spend their days sitting at a desk, poking around such bleak emotional terrain, you might well ask? I do. The landscape is incredible. Thoughts on this post? Scroll down to leave a comment. Lately, I’ve been restless. Vancouver Island is incredibly beautiful, but every now and then wanderlust kicks in and I want to hop on a plane and see new sights. In fact, a few weeks ago I’d booked a flight to San Francisco. My boyfriend, Doug, and I were planning a wonderful road trip down California’s iconic Route 1 to Monterey and Big Sur. But like Lennon said, life’s what happens when you’re making other plans. I had a minor cystic fibrosis exacerbation, and we both decided it would be best to call off the trip for the time being. Meanwhile, I was still restless! “Let’s go out for dinner,” Doug said last night. We ended up at Ithaka Greek Restaurant on Cook Street. It was just the change of scenery we both needed. The walls are cobalt blue and strung with glittering lights, and the Adamopoulos family welcomed us in with such warmth, I felt myself swept into another world. 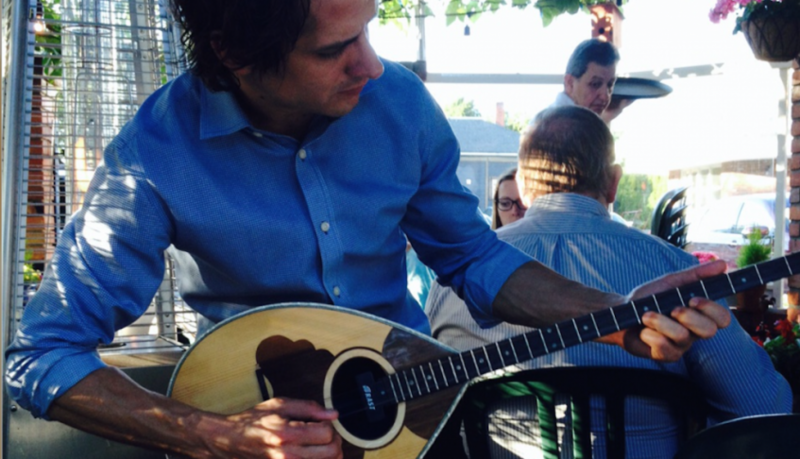 Within moments, brothers Andreas and Dimitri Adamopoulos broke into a spontaneous Zorba the Greek dance, after which Andreas pulled a bouzouki off the wall and began to play. Shortly after, Andreas smashed a plate in the traditional celebratory Greek style, much to my delight. Greek plate smashing is an expression of revelry, but I’ve read that its origins may have come from ancient feasts, during which ceramic vessels were smashed in honor of the dead—the theory being that controlled loss helps us to make peace with life’s many uncontrollable losses. For my part, I felt both joy and release when that plate was smashed. To life, magical and unfathomable, with all its confounding miseries and miracles! Opa! Lest you think the restaurant’s appeal is all about the entertainment, let me tell you a bit about the food. No wait, let me show you. Yum. The vegetarian platter with a chicken skewer (flying vegetable). The picture’s a bit blurry, but that’s because we were in a blurry haste to devour all this food! 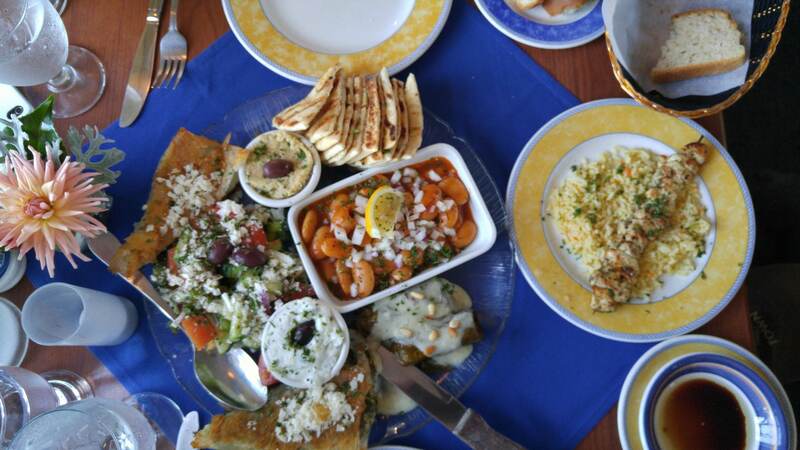 Dolmades, spanikopita, yeegandes, tzatzki, and other yumminess. And I was too excited about the ekmek—an Athenian dessert involving rusks soaked in spiced syrup and a layer of vanilla custard, topped with whipped cream, roasted almonds, and chocolate syrup—to take a picture. The recipes have all been handed down from generations of “yai-yais” (Greek grandmothers), say owners Maria and Thomas Adamopoulos. For a moment, it was easy to believe we’d wandered into Nafpaktos, the Adamopoulos’ scenic hometown in Greece. In case you’re curious, here’s what Nafpaktos looks like (video by Dimitri Adamopoulos). Can’t you just feel that sunshine and smell the breeze off the Gulf of Corinth? Of course, it’s hard to think of Greece right now without being concerned for the country, which struggles to accommodate tens of thousands of refugees from Syria, Afghanistan, and Iraq, as they seek sanctuary in Europe. From my comfortable home on Vancouver Island, I read news stories about the area and wish I could help. A friend of mine spent the winter cooking for refugees on Lesvos, and I so admire her for it. Perhaps someday I’ll be able to travel to beautiful Greece, both to take in the sights, and volunteer to help out. But it seems that, for now, I’m meant to stay put. Bloom where you’re planted, they say. And I’m so fortunate to be planted here in Victoria among the tall trees, flowering bushes, beautiful beaches, teeming tide pools, amazing eateries, bookstores, and cultural happenings. To say nothing of the freedom of having one’s basic needs met—something I take for granted all too often. Sometimes, you can travel a great distance simply by wandering to a new place in your neighbourhood. So, thanks for my Big Fat Greek Staycation, Ithaka Greek Restaurant. I’ll be back. Oh, and Big Sur? I haven’t forgotten about you. I’m going to meet you one day soon. Despite the fact that it doesn’t yet have a beginning or an end, I wrote 25 pages in the middle of my book last Sunday. For the life of me, I can’t seem to write in a linear way. I always seem to start in the center and work my way outwards from there. 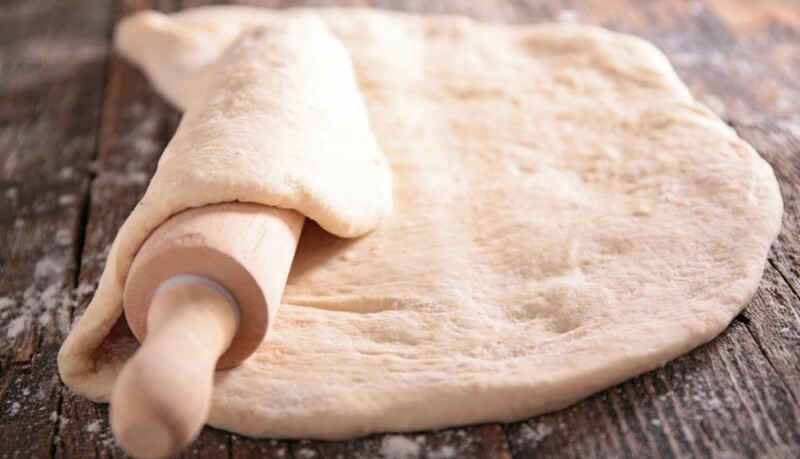 This analogy has probably been used before, but for me, writing is like rolling out dough. You start with a big, blobby mass—an idea of an idea of something you want to explore—and then you press it out from the center, gently working your way towards the edges. But it’s important to start in the middle. 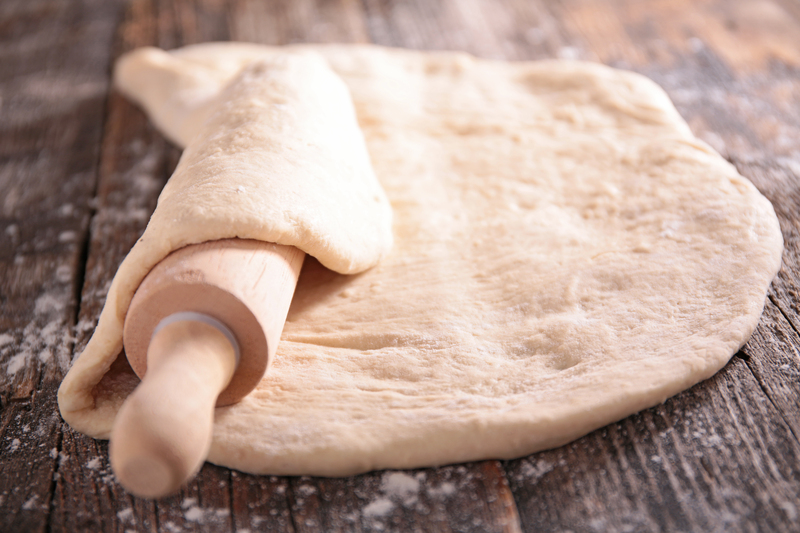 If you were to roll your dough from one one side to the other, you’d end up with a lopsided mess. Of course, everyone writes differently. My sister, a novelist, thinks up her plot and characters first. Then, she methodically proceeds from the first chapter to the last. Isn’t that wonderful? Oh, to write in such a linear way! I remember the first, chaotic short story draft I presented my prof in college. The poor man! I’d basically dumped a bunch of thoughts on the pages—potential characters, possible things they’d say, possible plot lines, cryptic notes to myself, random words I liked the sound of. It was a strange, jumbled salad that made sense only to me. But two weeks later, I had a solid short story that my prof really loved. I’ve since learned to present editors with much more coherent first drafts, but I still tackle my material the same way: from the inside out. I love that, and I live by it. In the nonfiction book I’m s-l-o-w-l-y writing, I invariably gravitate towards the scenes that reach for me with hot hands and say, “Write me first.” I’m trusting that the beginning and end will take care of themselves, as they do in my shorter pieces. Another thought about writing from the center outwards, if that’s your thing: it’s an opportunity to cut loose. Life—at least in my case—requires so much discipline and restraint. Because I have a mild lung condition, I’m quite regimented about what I eat, when I eat, when I do my physio, when I go to bed, etc. And as a freelance writer, I have to be diligent and self-directed, otherwise I’d be broke! But in my personal writing, I can be messy, wild, and self-indulgent in my approach. It’s a rare thing, and I cherish it. So for now, at least, I’ll continue writing from the middle outwards. If you were sitting here with me, I’d ask you: how do you write? And why? I’m curious to know. Feel free to share your thoughts in the comments below. Now, off to find some pie! Sometimes, it begins with a head cold. Other times, a CF flare-up starts with a raw burning in the chest that makes me feel like I’ve been chain-smoking all night. But however it begins, it always ends with a lot of medicine. During my last bout, in January, here’s what it took to calm things down: a month of inhaled tobramycin (four capsules twice daily), two weeks of clarithromycin (two pills twice daily), followed by a week or so of prednisone. That’s actually not bad by cystic fibrosis standards; chest infections send a lot of CF patients to the hospital for IV treatments. I’m one of the lucky ones, which is what I’m trying to focus on as the telltale signs of a new infection set in: slight shortness of breath, productive cough. 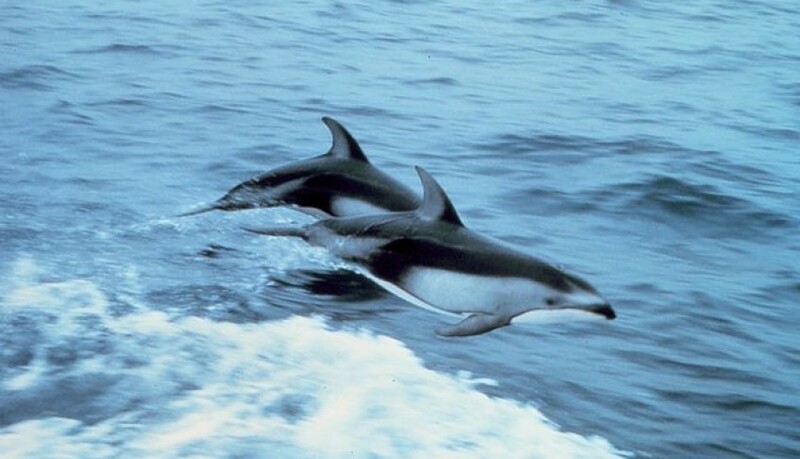 I’m also thinking about Pacific dolphins. Last Sunday, on the ferry back to Vancouver Island after a weekend with friends in Seattle, I saw some Pacific Dolphins in the waters of Puget Sound. I’d had my nose in a wonderfully smutty book for forty-five minutes or so when I looked out the window for a moment. That’s when I saw it, ten metres away: a dorsal fin disappearing under the waves! And then another, and another, and another! Several grey, slick-backed beauties darted in and out of the surf before disappearing in it altogether. Photo credit: Captain Budd Christman, NOAA Corps. What a gift! And this on the heels of a wonderful weekend of laughing, shopping, and wandering along pebbled beaches with old friends. And ice cream! Did I mention the Molly Moon’s ice cream? We shared scoops of honey lavender, salted caramel, and Earl Grey, garnished with sour cherries and candied hazelnuts. The taste of friendship: whipped cream and sprinkles melting on your tongue as you snort with laughter together under the hot sun. Is there anything better? 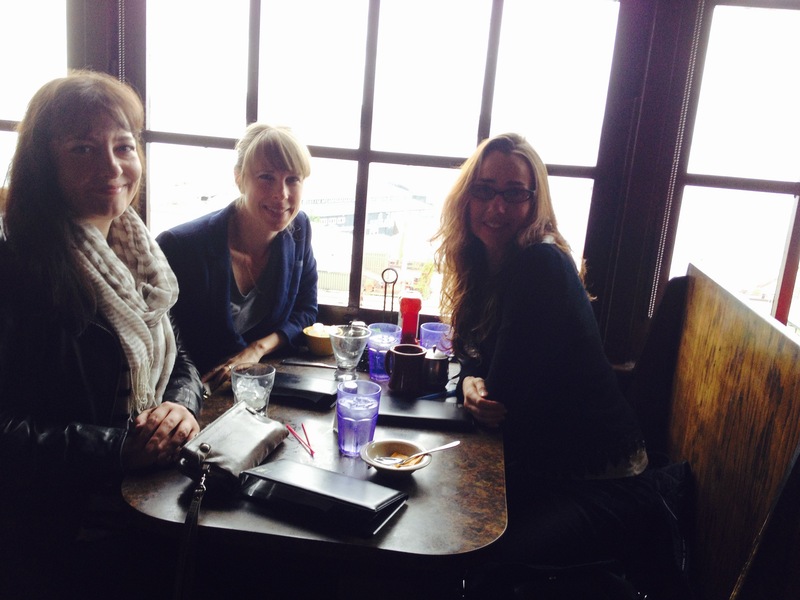 The girls and me after fresh fish tacos and eggs benny with crab at Pike Place Market. When a new CF flare-up settles in, I tend to oscillate between self-pity (Wah! Not again!) or anger (F#@k you, CF!). Or I turn to allegory (I’m just like Sysiphus, forever pushing a boulder up a hill only to have it come tumbling back down!). But then I gently force myself to adopt a broader perspective. I’m safe, I’m loved, I’m so lucky in so many ways. I don’t live in a war-torn country, I live on beautiful Vancouver Island. So I’m writing this post as a reminder to shift my attention to the positive, whenever possible. I might have CF, but I also have good friends, great adventures, and much to be thankful for. Life is like a ferry ride: sometimes it’s smooth sailing, and the waves gently unspool before you like blue silk stretched taut. Other times you ride the giant swells like a rodeo queen. And still other times you cower in the back, seasick and wretched. 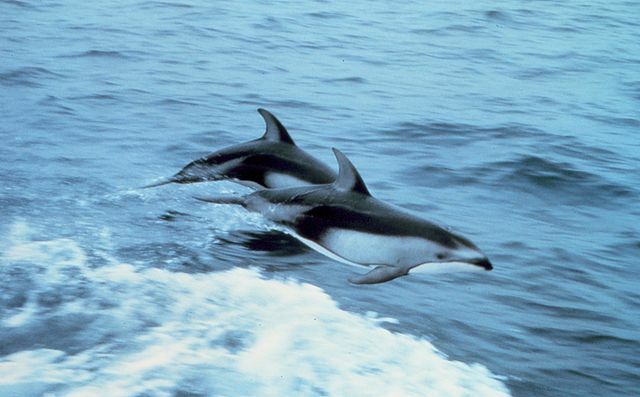 But always, there are unexpected gifts: like a pod of Pacific dolphins dancing like quicksilver in the unfathomable blue sea. 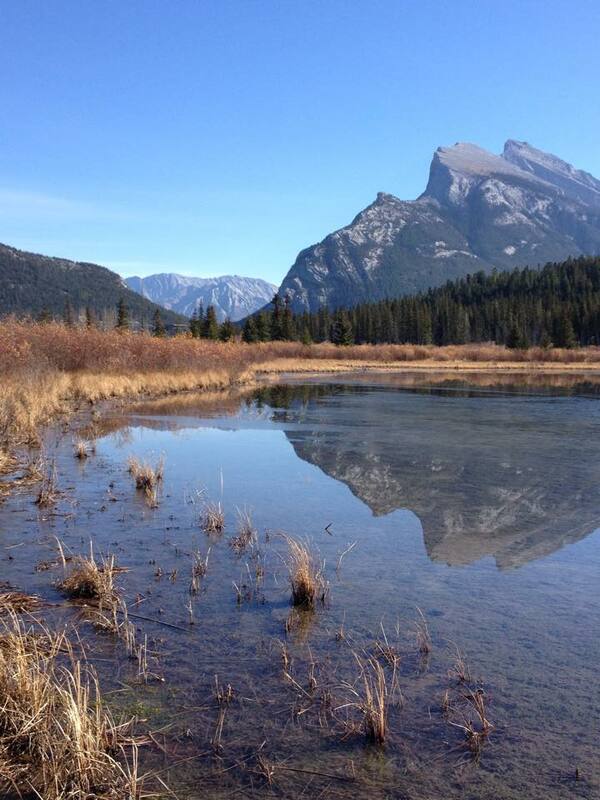 As spring turns into summer, I find myself Googling writing residencies. There’s really nothing like spending a few weeks—or more, if you’re lucky—writing and talking shop with fellow writers, artists, musicians, and filmmakers. 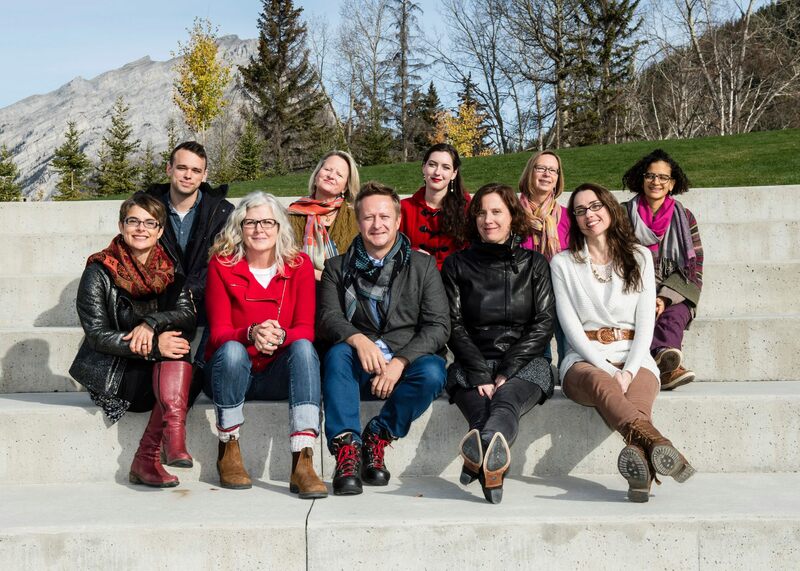 Last October, I was fortunate enough to participate in the debut Memoir Residency at The Banff Centre, nestled in Alberta’s Rockies. For two weeks, I had the privilege of studying memoir under Karen (Kaz) Connelly, Alison Pick, and Alexandra Fuller—three exceptional Canadian authors who are as warm and encouraging as they are accomplished. The program was directed by the exceptional Devyani Saltzman. I learned a great deal from my peers, as well, as we discussed our projects and hiked among the hills. 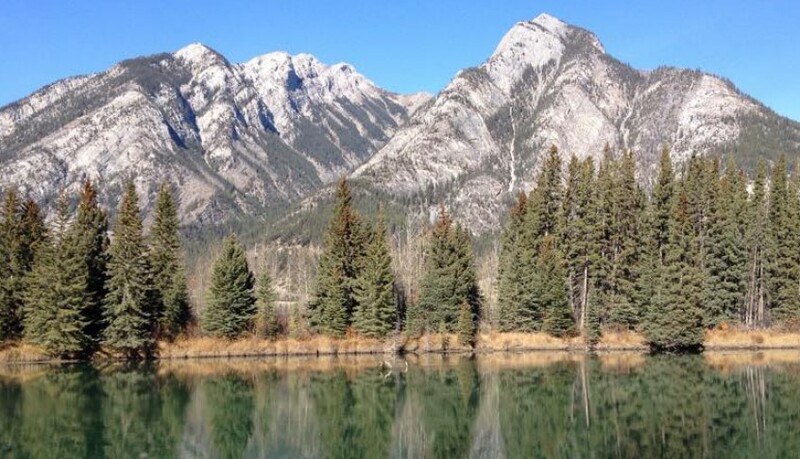 The scenery was spectacular, and so well suited for a writing residency. After hours squinting into a computer screen, I’d emerge into the sunlight and find myself awestruck by the mountains; it was just what I needed after all that intense focus. My memoir-in-progress, if you’re wondering, is about growing up in Fairfield, Iowa, the nexus of the Transcendental Meditation movement. Like many of my former Maharishi School of the Age of Enlightenment alums, I’ve found myself reflecting upon those unorthodox high school years spent studying Sanskrit alongside Shakespeare while I lived in Utopia Park—the town’s trailer park for meditators. In recent months, however, my writing—and the book—seems to be shifting in focus as I grapple with cystic fibrosis, a genetic lung disease. During a weekend trip to Galiano Island, in the Southern Gulf Islands here in Canada, I wrote an essay about my illness and what larger lessons it may have to teach me. That essay, “Wild, Salty Body of Water,” will be published in The Rumpus in the next few months. Meanwhile, I continue to research residencies! I’d like to go somewhere new. My friends at The Luminous Writer are working hard to arrange an autumn workshop in Ireland, near Dublin, so if that comes together, I’d really love to attend. 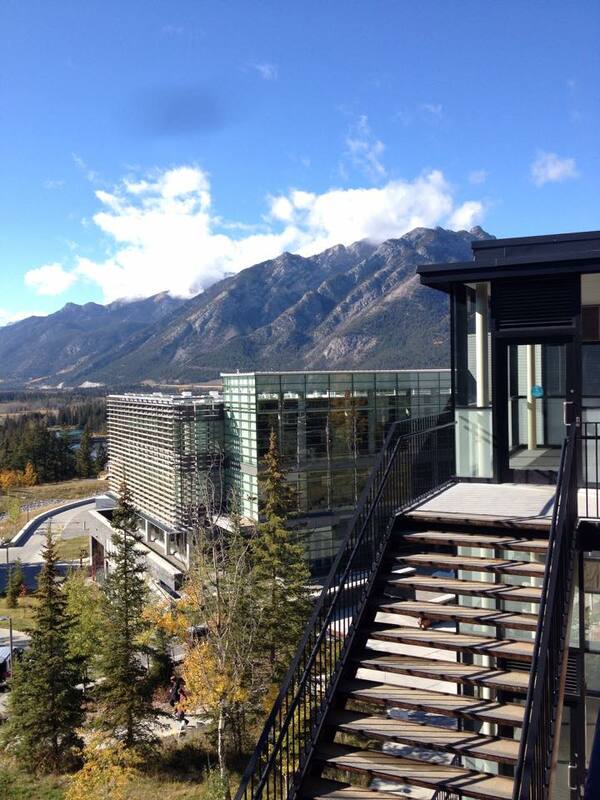 I’m also tempted to return to The Banff Centre sometime. If you’re a writer, a musician, artist, or performing arts professional, I encourage you to look into their programs. I did, and it was life changing.